Microsoft says it realised during the development of the Windows 8 Metro interface that it provided a better way for people to browse the web. "To deliver the best browsing across all Windows 8 devices, we re-imagined the architecture and experience of the web browser," explains Rob Mauceri, the group program manager for Internet Explorer in a new blog post on the Building Windows 8 blog. "While building and tuning the Metro style browsing experience for the Consumer Preview, we realised it is a better way to browse – whether on a desktop computer with a big screen, mouse and keyboard, or on a touch-enabled mobile device." Mauceri says that as people browse more "chromelessly" on their phones (an interestingly choice of words), they've "become accustomed to a more immersive and less manual browsing experience compared with the desktop". He also talked up the use of the Windows 8 charms (the pop-up icons on the side of the Windows 8 Metro screen or Windows 8 desktop) as an alternative to toolbars and menus. "We've found that many people – even those with the most enthusiastic and intense browsing patterns – prefer Metro style browsing because it's less manual and more focused on what you browse than on how you browse." 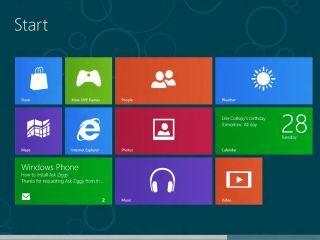 "The result in Windows 8 Consumer Preview is a Metro style web experience. IE10 is designed to make website interaction fast and fluid for touch as well as for heavy mouse and keyboard use."